Some types of malware attempt to disable your antivirus protection. To verify that Avast Antivirus is working properly on your PC, use the EICAR Anti-Malware Test File to test Avast Antivirus Web Shield and File Shield. Avast Antivirus Web Shield protects your system from malware while you use the internet (browsing, downloading files, etc.). If malware is detected while downloading a file from the Internet, the download is stopped to prevent the threat from reaching your PC. Open the EICAR website download page. Scroll down to the section labelled Download area using the standard protocol http and click the eicar.com link to initiate the download. The download site is blocked and Avast displays an alert: Threat secured, which indicates that Avast Antivirus is protecting you against malware. The File Shield in Avast Antivirus checks any programs and files the moment they are opened, saved, or copied. If anything suspicious is detected, it stops the program from starting, or the file from being opened, saved or copied, to prevent any damage to your PC and data. Web Shield turns on automatically after the selected time. If the EICAR test finishes earlier, go back to ☰ Menu ▸ Settings ▸ Protection ▸ Core Shields. Scroll to Web Shield and tick the box next to Enable Web Shield. Scroll down to the section labelled Download area using the secure, SSL enabled protocol https and click the eicar.com link to initiate the download via secured HTTPS. 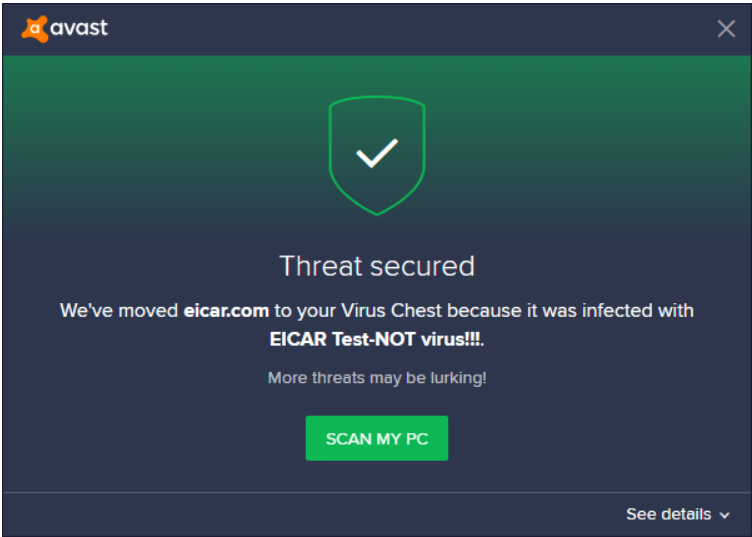 The file download starts and Avast displays an alert: Threat secured (by default, eicar.com is moved to your Virus Chest), which indicates that Avast Antivirus protects you againt malware.